From Sunderland, served with 18th Battalion DLI (Durham Pals). Durham County Council Education Department clerk. John Hanson Sinclair was born in Sunderland in late 1894. In 1891 John’s parents, John Thomas and Mary Isabella, were living at 29 Hendon Road, Sunderland; his father was described as a clerk, and his mother, unusually, had an independent occupation as a glass and china dealer, despite having six children – Frederick (who was not at home on census night, but was living with his maternal grandparents at 120 Harrogate Street), Ernest, Albert, Thomas, Lavinia and Winifred. By 1901 the family had moved to 45 Harrogate Street, and John Hanson Sinclair appears for the first time in the census as a six-year old. In addition to John, there were now three other children – Frank, Harold and Emily. All the children had the second Christian name of Hanson, which was the maiden name of Mary, their mother. By 1901 Mary was not given an occupation, but John Thomas was described as a relieving officer. He would have worked for the Sunderland Board of Guardians, receiving requests for poor relief, examining the situation of the applicants, reporting to the Guardians, and distributing any relief. Frederick now worked as an apprentice slaughterman, Ernest was a clerk with Sunderland Rural District Council, Albert was an apprentice engineer, and Thomas was a commercial clerk. By 1911 the family had moved again, this time to 31 Nelson Street. John Thomas was still a relieving officer and Frederick and Ernest had left home, but the remainder of the children still lived at home – Albert was now a marine engineering fitter, Thomas had followed his father and was now an assistant relieving officer, Frank was an accounts clerk with Durham County Council, Harold was an office boy, and John was a clerk with the Sunderland District Tramway Company. 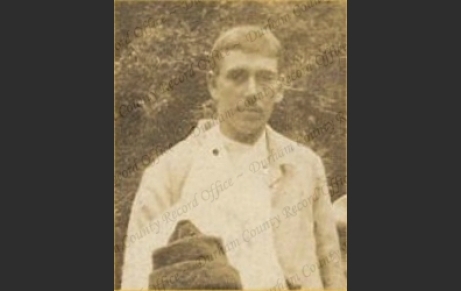 By 1914 John had changed jobs and followed his older brother in working for the County Council, but as a clerk (3rd grade) in the Education Department at Shire Hall. When war broke out John volunteered for the forces, and his permission to join the army is noted by the County Education Committee in November 1914. Initially he joined the 18th Battalion of the Durham Light Infantry, the ‘Durham Pals’. The unit was formed at Cocken Hall and became part of the 93rd Infantry Brigade and the 31st Division. He served with the battalion during its time in Egypt (December 1915 – March 1916) and when it moved to the Western Front. The circumstances of John’s death are not clear, but he died on 12 February 1919 and was buried at Ryhope Road Cemetery in Sunderland. His death was noted in the Education Committee minutes in April 1919, and is recorded on the Sunderland Thornhill United Methodist Church roll of honour and the plaque in Burn Park Methodist Church, as well as on the County Hall memorial. At least two of John Sinclair’s brothers served during the War. Frank also joined the 18th Battalion of the Durham Light Infantry and served in Egypt, but was transferred to the Yorkshire Regiment when he was commissioned as a Second Lieutenant. Ernest joined the 15th Battalion of the London Regiment which was sent to France in May 1916, but was then transferred to the Machine Gun Corps and also became a Second Lieutenant.